Jesus, who was actually “Yeshua” in his native tongue, was a radical revolutionary figure who led an insurrectionary movement on behalf of an exploited, defeated, and oppressed people. He stood against colonialism, corruption, wealth, individualism, and even a punitive law-and-order approach to life and society. 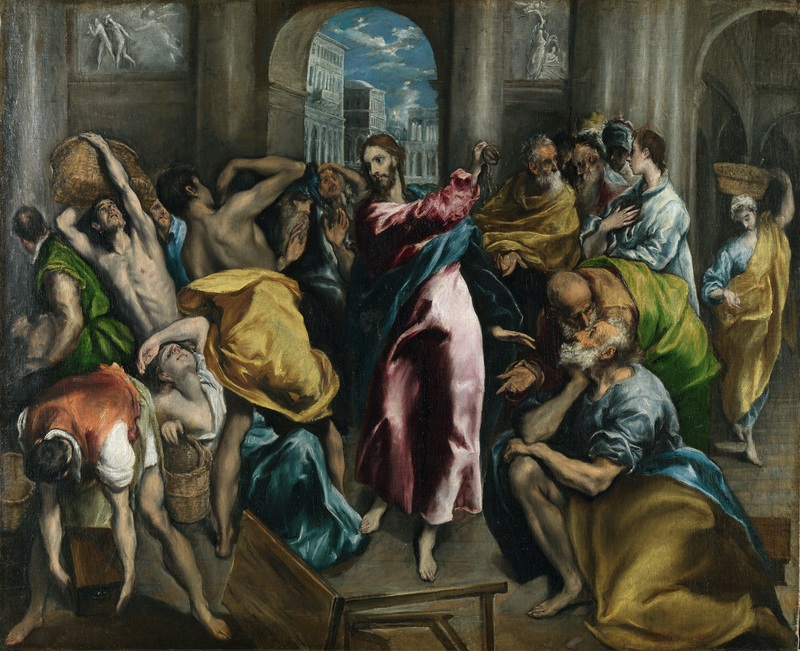 My mind is blown by how relevant such a movement can be seen in these dark and dreary times, yet I don’t believe it’s unfair to suggest that most Americans – Christian and atheist alike – will go through all the days of this Holy Week without ever really considering the implications of Jesus’ character, his actions, and his teachings. Anyway, the dichotomy between religion/spirituality and science/secularism is indeed a false one, but I could spend the rest of the night indulging in its arguments. That’s not what I’m here to do – this isn’t the general point but a specific one, one I think is worth considering, especially since you’re unlikely to fully escape Holy Week no matter how hard you try to ignore it. This is western civilization, after all. But my position, as wizard and man, in all instances is one of pro-inspiration. Here in this case, it’s not merely that the tale of Jesus’ is (or can be) inspirational on a spiritual, mythological, religious, or otherwise otherworldly level, but that it is (or can be) inspirational in an everyday, real-world, here-and-now sort of way. I alluded to all of this, from a slightly different angle, in my last post. But in order to squeeze the utmost inspiration from this narrative, it is necessary to hold at least a cursory grasp of the cultural and historical context in which it takes place. Jesus’ time was a time of profound transition for the Semitic peoples that inhabited the Levant. The twelve tribes of Hebrews had long since been diminished and dispersed and the small nation-states they formed, Israel and Judah, had long since been shattered. There was not even a “Palestine” the way we conceive of it today, nor were there “Jews” the way we think of them today. The region, having been conquered by Rome, was split into several Roman colonies, including (I’m probably missing some) Judea, Samaria, Galilee, and Idumea. Rome had conquered the region, but it permitted the central worship of YHWH (the Old Testament God we know and love) to continue unabated. In fact, that’s an understatement – viewing this worship as that of a rustic, hick cult, it perpetuated its prominence and consolidated Roman power by collaborating with the elite theocracy that surrounded the Temple. Christianity is not (in its present form, anyway) a religion that is dependent upon geography, so it’s difficult for modern-day students of Jesus to properly remember that the worship of YHWH was utterly centered around one single spot – the Temple in Jerusalem. God didn’t live up in the clouds or in space, he lived in special room in the center of a building on a hill in Jerusalem. Nobody was allowed into that room except for one dude on one day of the year. That guy was the High Priest. An entire hierarchy ran down from him – classes upon classes of priests and “scribes” and others whose trade took place within the temple. This hierarchy was itself geographical – it wasn’t just the one room that was sacred, but the entire Temple that was structured as a series of walled-off levels that got progressively more holy the further you went. Anyone could get in the first gate, but people who weren’t Hebrew/Jewish couldn’t get in the second gate. All year round, sacrifices were held there. You had to make sacrifices – usually of animals or whatever – or you basically weren’t a real person. And in order to make these sacrifices, you had to buy some stuff to sacrifice in the Temple. And even though the land was filled with all manner of different currencies, you had to buy the stuff to sacrifice in the Temple with one particular type of currency, which was available for exchange within the Temple. Can you see how this might lead to outrageous corruption? How the HEREDITARY class of priests and merchants who controlled the currency exchanges, sacrifice sales, fees and taxes required to make the sacrifices themselves, etc. might resemble not merely the archetypal oligarchs of all time, but those who are currently the masters of our marketplace, our Secular Temple, our very lives in our current society? These guys got wildly rich because everyone was forced to play their game. It had nothing to do with God and everything to do with money and power. The priest class cooperated with Rome, promising to restore order, and Rome allowed the Temple Theocracy to exist, so that the priests could become wildly rich at the expense of their “countrymen” and rule over their lives in every possible way. This is what Jesus was trying to overthrow, and this insurrectionary opposition was what got him killed. It was never primarily a beef with Rome itself – after all, he had no problem telling everyone to pay their Roman taxes – it was a beef with corrupt religious and secular exploitation, a beef with the brutal oppression of a poor and overburdened people. Like many revolutionaries before and since, he roamed the countryside teaching crazy things like a just and egalitarian Kingdom of Heaven, giving things away to people who ask and need, forsaking wealth, forsaking judgment and punishment of others, and the utter importance of loving and even empowering the poor and the outcasts. Then, in an event Christians celebrate on Palm Sunday (last Sunday, for you heathens), at the moment of his movement’s peak popularity, he brazenly rode into the capital city of Jerusalem, right into the belly of the beast. He probably knew he was going to die for what he was doing. He wasn’t shy, either. As soon as he showed up into the city, he and his posse marched right into the Temple and started flipping over all the tables. This wasn’t the act of a hippie at a sit-in. This was righteous fury. This was political treason. This was like shutting down Wall Street trading by physically wrecking it. They killed him for it – just like they’d kill you or me today if we ever tried anything of the kind. To derive inspiration from a man who so loved this world and the people in it, and especially the lowly, downtrodden, mistreated, depressed, and pissed off people in it, is not some empty hope in salvation by external heavenly source. Quite the contrary, in fact – it’s a call to action. It’s a reminder that, even if we may not be capable of overturning those tables and destroying the corruption of our modern-day capitalistic Temple, we must recognize the positively wondrous character of the very notion and we must, at the very least, attempt to override its influence by a change in our own character. I don’t mean this in an individualistic, self-help, change-your-mindset kind of way. I’m talking about people really coming together in common, in compensation-free generosity, in a radical shift of our priorities away from protecting what little might be ours and toward increasing the lot of those who need it the most. I’m always inspired at the idea that the way to live a holy life is to scorn the BS institutions of commerce and material consumption that permeate and rule our lives in no less oppressive a way than a collaborationist Temple Theocracy, and to turn instead toward the collective well-being of all people. This is politically radical stuff, even to this day. It’s not liberal, it’s downright communist, I love it, and I love Holy Week. If the socio-economic-political narrative isn’t enough to sway you and you’re comfortable with classical music, set aside a couple of hours to sit down with Handel’s Messiah. Google the lyrics so you can follow along. I don’t care what your spiritual beliefs are, it’s one of the most beautiful pieces of music ever composed. It’s all in English, and all of the “lyrics” are just verses pulled verbatim from the Bible. If Aslan’s literary-historical portrait of Jesus doesn’t move you, Handel’s musical portrait damn well might. Converts me to Christianity, if only for a moment, every single time. It’s a beautiful, moving, passionate tale – not of princes and princesses and goddesses and gods and noble people and superhuman “heroes” – but of ordinary peasants living in a dark and depressing time, a time that seemed a lot like the end of the world. We are those peasants, and that is our time.